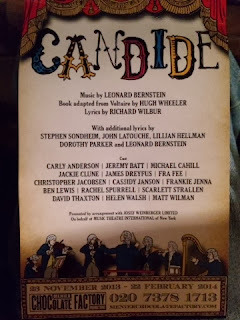 Last week Stuart and I went to see Candide at the Menier Chocolate Factory in the London's increasingly glitzy but not quite there yet London Bridge Quarter. Oh dear. Where to begin? "It was boring", how about that? All the worse aspects of Pippin - over-long, hey fiddle-dee ye olde worlde episodic travelogue, mediocre lyrics, trite plot line - were just about saved by excellent tunes, acting and singing. James Dreyfus and Jackie Clunes sang their hearts out but sadly the source material was just too weak. It looked great and was performed with great gusto but... but... it just wasn't a very good piece in the first place. In my humble opinion a rare dud from The Menier Chocolate Factory. Avoid.